When SNL opened its show three years ago at this time with a choir singing "Silent Night," in tribute to the children killed the day before in Newtown, I couldn't help but flash back to an earlier rendition of this song after a much greater (that is, more massive) incident of the slaughter of innocents. 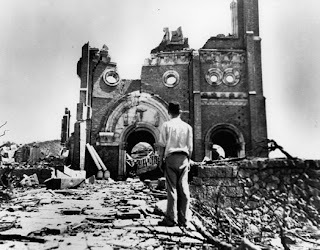 The song was sung at Christmas, 1945, by parishioners who had gathered at the Urakami Cathedral in Nagasaki, the largest Catholic church in the Far East, which had been mostly destroyed (see above) by the very unnecessary second U.S. atomic bomb on August 9, 1945--which had exploded, a little off-target, right over the large Catholic section of the city. The vast majority of the 80,000 or more killed that day were children and their mothers and school teachers. I learned about the "Silent Night" when probing the footage shot in Nagasaki and Hiroshima by the U.S. military--and then suppressed by the U.S. for decades. This forms the basis of my book Atomic Cover-up. You can see some of the footage they shot in the brief video that I created but not the "Silent Night" section. Perhaps I can upload it off VHS some way. In a moving tracking shot that goes down the center aisle, it shows the congregants--women with heads covered by a white, filmy veil--singing with battered walls behind them (you don't see the absence of a ceiling above). It's the only part of the tens of thousands of feet of film that includes sound. Hence we know they are singing "Silent Night." And many no doubt thinking of their missing children, destroyed one day in a matter of seconds.